Prior to his birth John Niu was genetically engineered by a criminal organization and cult led by his father, through a combination of of science and magic to be the human host of a fallen angel named Azrael. The twenty-third in a long line of experiments, he was the only child to survive the process. Through the actions of his friend and surrogate father, Nicholas Bai, he was rescued from the hard, brutal life that he had been destined for. Unfortunately, John's mother was killed before they could escape. Eventually, the cult caught up with them and Nick was mortally wounded. Tapping into a power he didn't understand, John rescued his mentor by merging their souls and minds together while bringing Azrael along and becoming the amnesiac fighter known as Caesar. Partnering with the angel, Talion, the two managed to exorcise the demon from them and John regained his own body. After the Baron and his evil forces laid waste to Void City, John and Nick left to train in peace and tie up some loose ends. Now, Nick has gone missing and John's come back to Void to find him under the new name, Octavian. 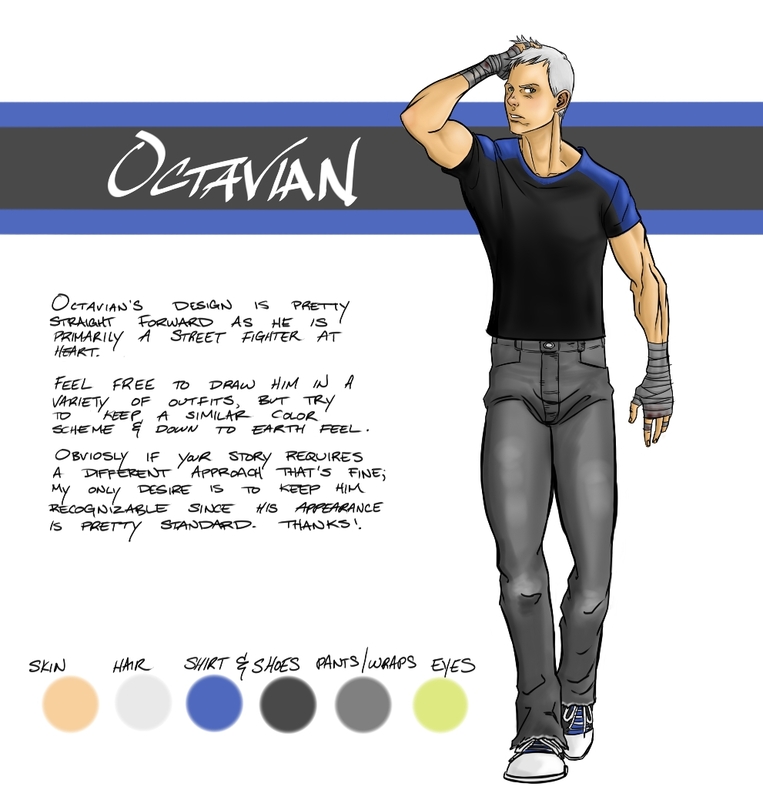 Octavian has superhuman strength and speed due to his genetic enhancements. In addition he has spent several years studying with his mentor, Nicholas Bai, a prolific master of martial arts. However despite this training he is still a bit of a brawler at heart. John is of mixed ethnicity. He is 50% Chinese, 25% Japanese and 25% Irish.